Could be Kate, never got notified though? Can see leg ring, gonna ask ND abut it! Cam down .... are they ringing? Very disappointed we weren't told! 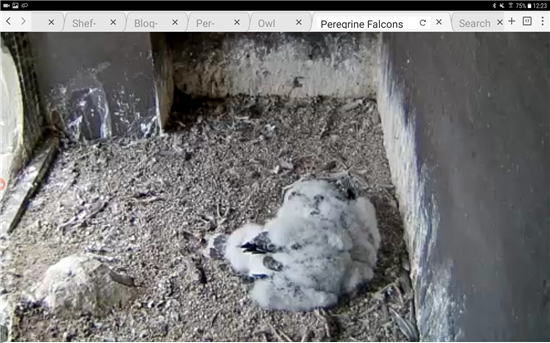 This footage from a little while ago so one possibly fledged yesterday when I was busy! ***the camera got turned off last day of june as little point in paying for another 3 months of viewing an empty box. Both of our juvs needed rescuing but one just required putting on a roof before she flew properly. The 2nd to fly left the trefoil 2 days later then wasnt seen until next day when I heard her stuck in a hidden roof gulley so I rescued her. Can't believe another came to grief ... will post news as I get it! Doh!! would like some better news please .... precarious little lives they try to lead Awh!!! Wendy do you want to start 2019 off?